Make up to $28 per CD! New students of hypnosis need to build up their library of hypnosis music. 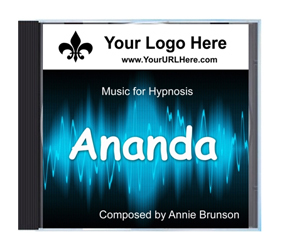 Now you can purchase Music For Hypnotherapy CDs at a deep discount so you can sell to your students. Every CD will be shrink-wrapped and professional manufactured. Your logo will be placed on the front cover of the CD. These are NON-Royalty Free prices. You may mix and match. Students can purchase a Royalty Free License through you - your wholesale cost from me is $15 after you have purchased bulk CDs (you will have a wholesale order form for licenses). Pay for Licenses as you go - no minimum order. See my STORE for recommended retail prices. You can make up to $28 on each Royalty Free CD! Prices for SHANTI and SOMNIS on request (these are multi-disc titles). TO ORDER, please contact me by email. Please allow 7 days for your CDs to be shipped to you after approval of CD cover.